Bite faults are one of the first hereditary defects a fledgling dog breeder learns to recognize. Teeth are right out there where everybody can take a look at them. Once you learn what is right for your breed, it isn’t difficult to recognize what is wrong. Though a dedicated cheat may “improve” a dog’s bite through orthodonture, there are limits to what can be done. For the most part, what you see is what you’ve got. In order to fully understand bite faults, you must also understand what is correct and why. This goes beyond having the right number of the right teeth in the right places. 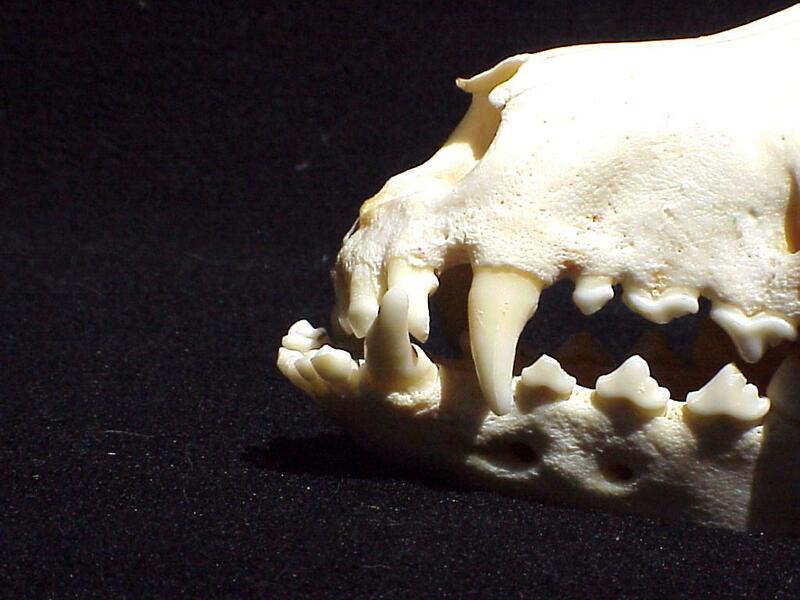 A dog’s dental equipment is a direct inheritance from his wild carnivorous ancestor, the wolf. 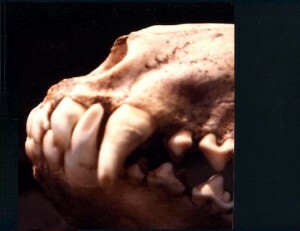 Dog dentition is also very similar to the wolf’s smaller cousin, the coyote. 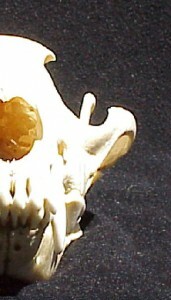 Figure 1 is a coyote skull, exhibiting a normal canine complement of teeth. Each jaw has six incisors at the front, followed by two canines, then eight premolars (four to a side). When we come to the molars, the top and bottom jaws differ. The lower jaw has six and the upper only four. A normal dog will have a total of 42 teeth. Have you ever wondered how paleontologists know what a particular dinosaur did for a living? They look at the teeth. The number, shape, size and position of teeth will tell a lot about what that dinosaur’s diet was. If you know what it ate, you can draw some good conclusions about how it might have behaved. We know what wolves and coyotes eat. The toolbox for delivering their self-serve meals is carried in their mouths. They don’t have a cat’s sharp, retractable claws and inward-turning wrists for grasping prey. Feet and legs get the wolf or coyote to the table, but they don’t serve the bacon. That must be done with the teeth and each type has a specific purpose. The canines are most critical to catching and holding prey. Readers familiar with police K9s or Schutzhund will know that the preferred grip is a “full mouth bite:” The dog grasps the suspect’s arm or leg well into its mouth, between its molars and premolars and behind the canines. This is not the way a wolf does it. A wolf grips with the front of his mouth. The four canine teeth puncture the prey. Their overlapping structure (see Fig. 2) combined with jaw strength prevents the prey animal from pulling free. When catching bad guys, the idea isn’t to poke them full of holes and have them for dinner, but to hang on until the guy with the gun and the handcuffs arrives. Once the prey is down, the premolars are used for biting off chunks of meat that are swallowed hole. The 4th upper premolar and the first lower molar on each side, the carnasals, are especially developed for this task. (Fig. 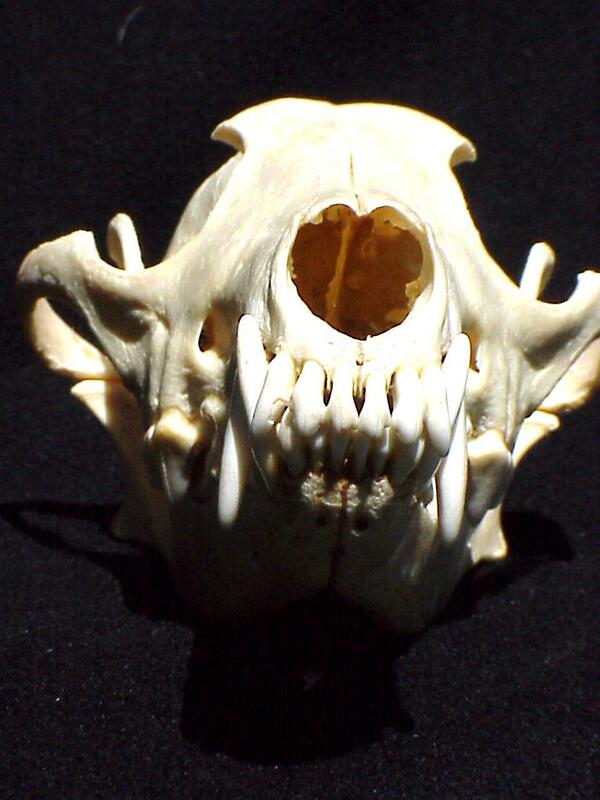 3) These are the most massive teeth in the canine jaw. They are very sharp and their location mid-way down the length of the jaw puts them at the point where jaw pressure is greatest. The incisors, located at the front of the mouth, are for delicate work. They nibble the last bits of meat off bones and are also handy for scratching an itch or pulling something bothersome out of the coat or from between the pads. , other than the lower carnasals, are flat for grinding plant matter. Wolves and coyotes will eat some amount of fruits, grasses and other plant matter. This food needs to be chewed a little to start the digestive process. Cats, by contrast, are strict carnivores. The only plant matter they eat is whatever happens to be inside the animal they are eating. Cats have no molars. All these specialized teeth are not independent entities. Their position in the jaw is determined by their function and they require a properly formed skull and lower jaw to function efficiently. The muzzle must be long enough and broad enough to accommodate the teeth in their proper locations. The animal must have sufficient bite strength to hold onto whatever it has grabbed, be it prey or perpetrator. Jaw strength comes not only from the muscles, but the shape of the skull. Figure 4 shows the skulls of a coyote and an Australian Shepherd. 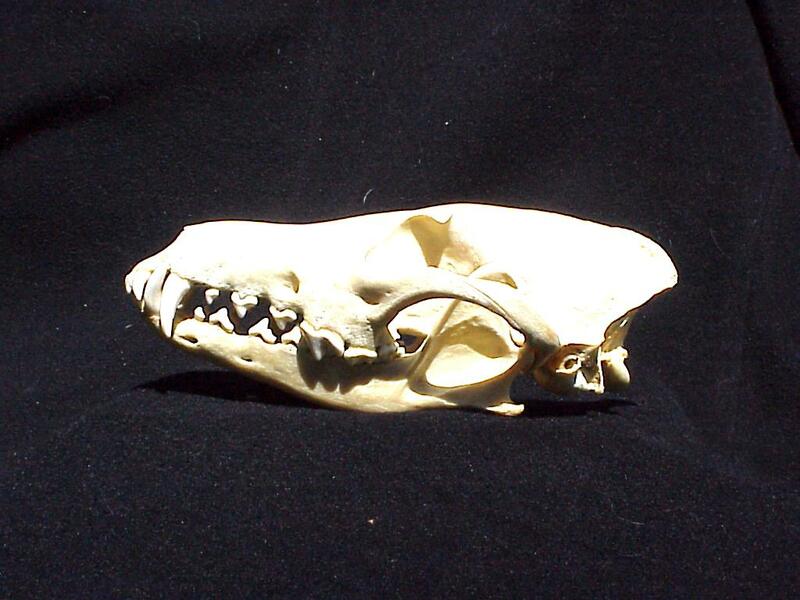 Aussies have normally-shaped heads, so the shape of its skull is very similar to that of the coyote. The jaw muscles attach to the lower jaw and along the sagittal crest, the ridge of bone along the top and back of the skull. In between it passes over the zygomatic arch, or cheekbone. 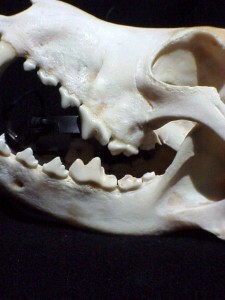 Wrapping around the cheekbone gives the bite much more strength than would a straight attachment from topskull to jaw. This attachment also serves to cushion the brain case from the flailing hooves of critters that don’t want to become dinner or get put in a pen. You will note that the crest on the coyote is more pronounced than on the Aussie and its teeth are proportionally larger. This is a typical difference between domestic dogs and their wild kin. Wild canids need top efficiency from their dental equipment to survive. We have been providing food for our dogs for so long that the need for teeth as large and jaws as strong as their wolf ancestors has long passed. Wolf – angle around the zygomatic arch (cheekbone) is aprox. 45 degrees. Australian Shepherd – angle is aprox. 60 degrees providing less jaw pressure. Jaw strength is reduced in the dog by a less acute angle around the zygomatic arch. Note the more pronounced angle in the coyote (Fig. 5a) as compared to the Aussie (Fig. 5b). 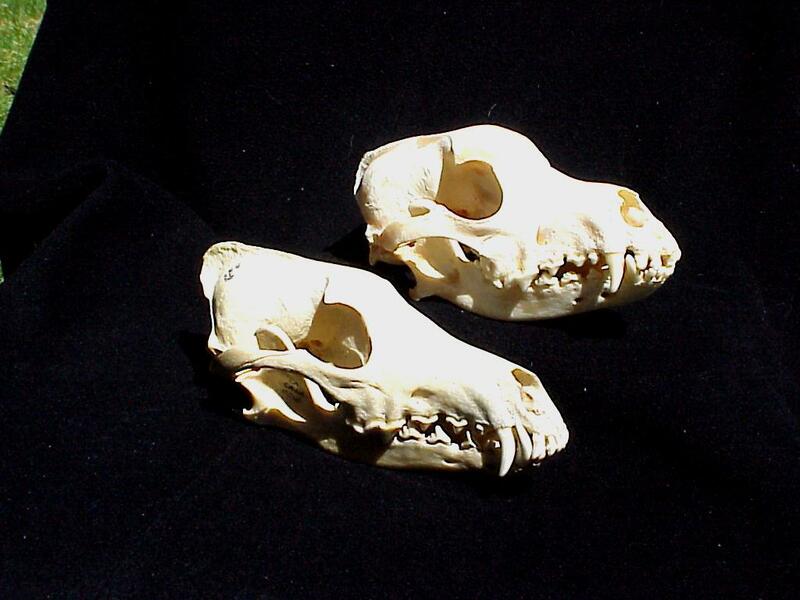 This is another typical difference between wolf or coyote and dog skulls. The larger sagital crest allows for a larger, and therefore stronger, muscle. The only breed with an angulation around the zygomatic arch that approaches that of the wolf is the American Pit Bull Terrier/American Staffordshire Terrier. Pit/AmStaffs also have a relatively short jaw, giving their heads a more cat-like structure: Broad + Short + Strong Muscles = Lots of Bite Strength. Breeds with long, narrow heads have even straighter angulation around the cheekbone, and therefore an even weaker jaw. The narrow jaw may also cause crowding of the incisors. 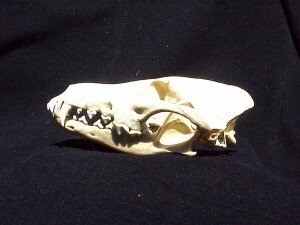 Toy breeds with round heads often have little or no sagittal crest and very weak jaws. Short-muzzled breeds may not have room for all their teeth resulting in malocclusion, meaning they don’t come together properly. The jaws of short-muzzled breeds may also be of unequal lengths. The more we have altered skull and jaw shape from the norm, the less efficient the mouth has become. In some cases, this isn’t particularly important. 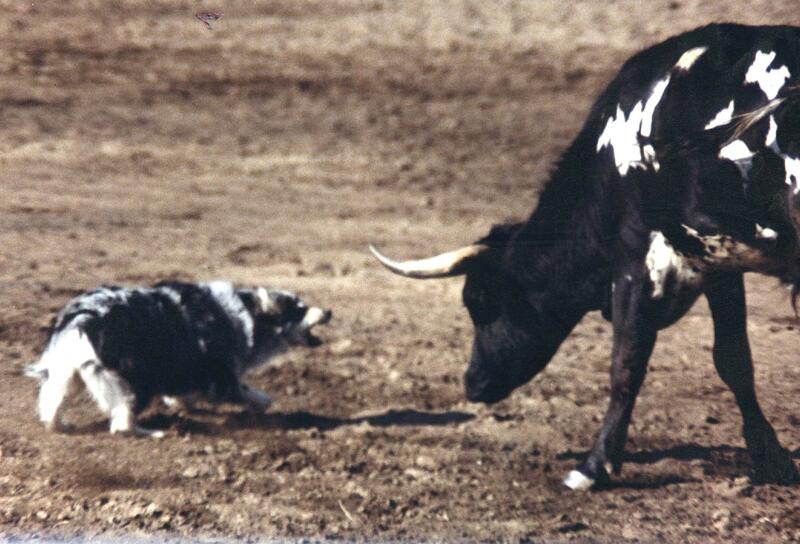 There is no reason for a Collie or a Chihuahua to bite with the strength of a wolf. However, jaws that are so short it is impossible for all the teeth to assume normal positions and undershot bites that prevent proper occlusion of the canines and incisors are neither efficient nor functional, despite volumes of breed lore justifying those abnormalities in breeds where they are considered desirable. For most breeds, like the Australian Shepherd, the skull shape has remained relatively normal. The short muzzle of the Pug and the undershot bite of a Bullmastiff, while quite acceptable in those breeds, would be deemed severe faults in Aussies and other normal-skulled breeds. Now that we know what is “right,” for most breeds, anyway, and why it is right, let’s look at what can be wrong, why it is wrong and what, from a breeding standpoint, can be done about it. 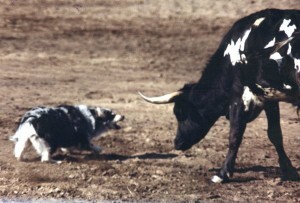 Most breeds with normal skull structure were originally developed to perform a function (herding, hunting, guarding, etc.) Since that structure is the most efficient it was maintained, with minor variations, in most functional breeds. Typical dental faults in these breeds are missing teeth and malocclusions. It is evident that these faults are inherited, but not a great deal is known about the specifics of that inheritance. In some breeds, some defects appear to have a simple mode of inheritance, but this is not the case across all breeds. That, plus the complex nature of dental, jaw and skull structure, indicates that in most cases the faults are likely to be polygenic, involving a group of genes. Missing teeth obviously are not there to do the work they are intended for. They should be considered a fault. The degree of the fault can vary, depending on which teeth and how many are missing. The teeth most likely to be absent are premolars, though molars and sometimes incisors may occasionally fail to develop. Missing a first premolar, one of the smallest teeth, is much less a problem than missing an upper 4th premolar, a carnasial. The more teeth that are missing, the more faulty and less functional the bite becomes. If you have a dog with missing teeth, it should not be bred to other dogs with missing teeth or to the near relatives of such dogs. Though multiple missing teeth are not specifically faulted in either Australian Shepherd standard, you should think long and hard before using a dog that is missing more than a couple of premolars. leaving most or all of the teeth improperly aligned against those in the opposite jaw. A bite that is this far off will result in teeth that cannot be used at all, teeth that interfere with each other, improper wear and, in some cases, damage to the soft tissues of the opposite jaw by the canines. In wry mouth, one side of the lower jaw has grown longer than the other, skewing the end of the jaw to one side. The incisors and canines will not align properly and may interfere. It is sometimes confused with anterior crossbite, in which some, but not all, of the lower incisors will extend beyond the upper incisors but all other teeth mesh properly. Minor malocclusions, including “dropped” incisors and crooked teeth, also occur in some dogs. Dropped incisors are center lower incisors that are shorter than normal. Sometimes they will tip slightly outward and, when viewed in profile, may give the appearance of a bite that is slightly undershot. Dropped incisors tend to run in families and are therefore hereditary. Crooked teeth may be due to crowding in a too-small or too-narrow jaw or the result of damage to the mouth, though the former is more likely. Some consider an even, or level, bite to be a type of malocclusion. Breed standards vary on whether they do or do not fault it. In the Australian Shepherd, the ASCA standard faults it while the AKC standard does not. There is clearly no consensus among dog people. Those who fault the even bite claim that it causes increased wear of the incisors, but there is little evidence to support this. A number of years ago the author, upon coming across a wolf with an even bite (Fig. 7), undertook a survey of wolf dentition. 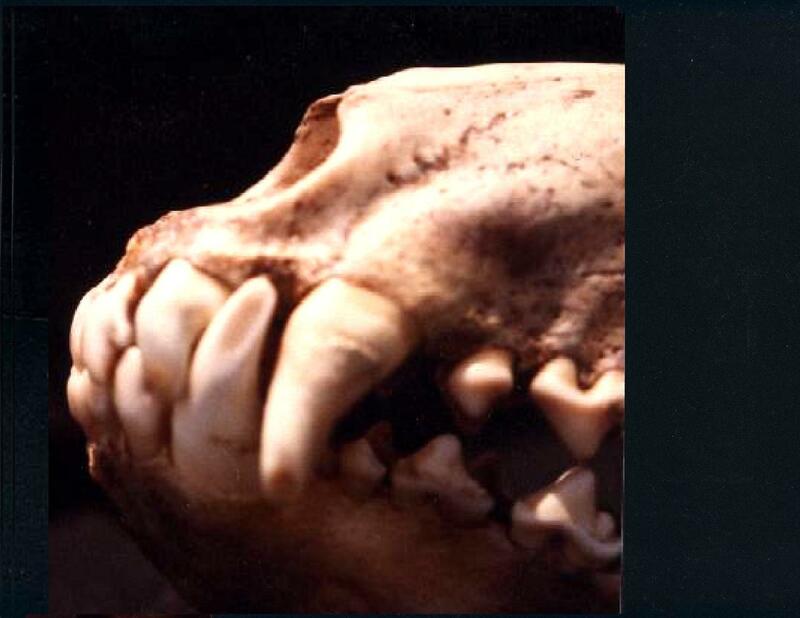 Teeth and jaws were inspected on 39 wolves, 9 of which were captive and the balance skulls of wild wolves trapped over a wide span of time and geography. Of the 39, 16 had even bites. This included five of the captive group, all of whom were related. Even discounting those, fully a third of the wild wolves had even bites. No structural fault is tolerated to this degree in a natural species, particularly in a feature so critical to the survival of that species. As stated previously, bite faults and missing teeth are likely to be polygenic in inheritance. Each is also variable in the degree of fault between individuals. Dogs that have dental faults bad enough to be considered disqualifications under the breed standard ought not to be bred. Minor bite faults have only minimal impact on the dog’s ability to function. Before it is bred, the degree of a dog’s dental faults will have to be weighed along with all the other virtues and faults the dog has. If the dog is then considered worthy for breeding, it should not put to mates of similar pedigree (where genes for the fault clearly lurk,) or to mates from families where the its dental fault is known to occur. If, when being so bred, the faulty dog throws multiple offspring with the same dental fault, or produces affected pups with different mates, then it should probably be withheld from any further breeding. The normal relatives of dogs with dental faults can be bred, but since they may carry some genes for the fault. If you own such a dog, you will want to select mates from families where this is not known to be a problem in order to reduce risk of perpetuating the fault. So now you know not only what can be wrong with a bite, but why. Bite faults are one of the easier hereditary problems to deal with. Even if you are a relative beginner, with an understanding of dental structure and function you can evaluate the quality of not only your own dog’s dentition, but that of any other dogs whose mouths you might gaze into. Check out as many as you can and remember who has (or does not have) what and who they are related to. Armed with this knowledge, you can make informed breeding decisions for your own dogs.